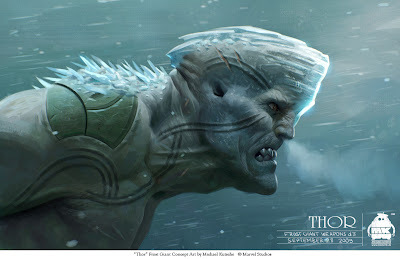 Bull Frost Giant concept art for "Thor", directed by Kenneth Branagh. Designed to give some serious headbutts! Didn't have a long lifespan in the movie though - his face had an encounter with Thor's Hammer. Awesome once again! Love these concepts. Love the simplicities in your strokes and subtlety in the design. Did all these concepts make it into the Art of Thor book that was released after the movie? Yes, most of them are in the book and some more. The book is actually quite voluminous. This is probably my favourite picture in the Art of Thor book ..it's just lovely ! Your posts are always of great quality.